Carlton Ridenhour, better known to the world as rapper “Chuck D,” started March 7th with an afternoon meeting with Cincinnati Mayor Mark Mallory.A?A?He ended it performing an energetic two hour plus concert with his band across the Ohio River in Covington, Kentucky, in the early hours of March 8th.A?A?”What band is that,” you might ask? Why, Public Enemy, of course. Possibly the greatest hip hop group in history. X Clan was the opening act. And, after an excruciating 45 minute delay caused by “technical difficulties” with DJ Lord’s turntable equipment, Chuck, the ageless Professor Griff (the guy still looks like he’s in his early thirties) and Flav exploded on stage. Assisting DJ Lord in laying down a massively heavy beat were PE’s live drum, bass and guitar rhythm section players, the BaNNed. Chuck and Flav quickly cleared out a couple of dozen young Republicans and Iraqi war veterans in the crowd by roaring into their scathing rant, “F*** George Bush.” I mean, didn’t these folks get the memo? Were they shocked by Public Enemy’s militant, anti-Establishment political stance? OhioFUNK writer/producer Sid Howard and I were there when Public Enemy leader Chuck D and PE founding members, Flavor Flav and Professor Griff, launched their twentieth anniversary “club” tour in front of about 800 enthusiastic fans at Covington’s Madison Theater. The pioneering rap group released its first album, Yo! Bum Rush the Show, in March 1987. Chuck paused, mid-concert, to honor the late James Brown. He and Flav then surprised those in attendance by bringing former JB bassist and Cincinnati native Bootsy Collins onstage. Collins, Flavor and Chuck improvised a rap to the Godfather’s 1971 hit, “Soul Power.” Flavor later cajoled Bootsy into playing the bass during a well-intended, but awkward “solo Flav” encore that was clearly designed to appeal to all the twenty-somethings drawn to the concert by VH1’s “Flavor of Love/I Love New York” reality series. Public Enemy performed some of its more recent releases, such as “Bring That Beat Back.” However, the group didn’t disappoint fans who came to hear the classic PE hits. They delivered with gusto their rap anthems: the ever-popular “Don’t Believe The Hype,” “Rebel Without Pause,” “Can’t Truss It,” ” “Black Steel In The Hour of Chaos” and “Give It Up” from the Spike Lee/Denzel Washington movie, He Got Game. But, it was the Public Enemy song associated with another Spike Lee movie, Do The Right Thing, that brought down the house. “Fight The Power” even had the tatooed bartender with the Iron Maiden t-shirt nodding to the beat. PE added a classy finish to its most famous tune by having a background singer segue the chorus into the Isley Brothers’ “Fight The Power.” Same title, different song. The Isley Brothers are from Cincinnati, too. Chuck D knows his history. 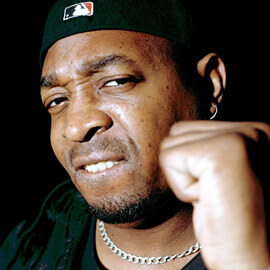 Public Enemy’s March 2007 tour has club dates slated for Chicago, Toronto, Boston, New York City, Dallas, Houston and New Orleans, before it closes in Miami at the UltraMusic Festival on March 24th. Check out otherA?collaborative worksA?by Enteje founders.